Christmas and New Year feel a million years ago now and the normality of the daily routine and the chill of January have certainly taken hold. So in a way, it is nice for me to write this post and reminisce about some of the wonderful food I enjoyed and the fun times I shared. As I mentioned in my last post, we were lucky to have some of our friends join us from the UK for the weekend over New Year. We have lived in South West France now for just over four years and the thing we miss the most about the UK (apart from take-away food) is seeing our friends so their visit was very special and we had been looking forward to it for ages. I really wanted to make sure that we ate like kings but there was a good balance between time spent cooking and time spent celebrating. So I tried to devise menus where some dishes were made plenty of time in advance and only a little cooking would be required on the night  especially for the New Year meal itself as I knew that I would most likely have begun drinking early in the day and so the likelihood of disasters threatened! 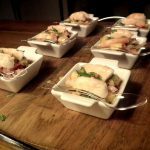 Fortunately our guests were always offering to help and so I enlisted the boys to make the magnificent canapés to kick off the evening which we served with some Party Punch whilst I prepared the main course leisurely in the afternoon. 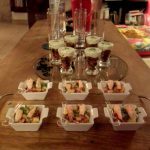 I am a huge fan of the fashion of serving canapés in interesting vessels which undoubtedly helps to create a wow factor. 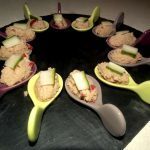 Here in France the shops are full of dinky spoons, pots, cups, jars and glasses where petite portions of exquisite morsels can be nestled to create show stopping canapés. I own many variations of such pots and decided to use a selection to demonstrate how visually exciting they can be. 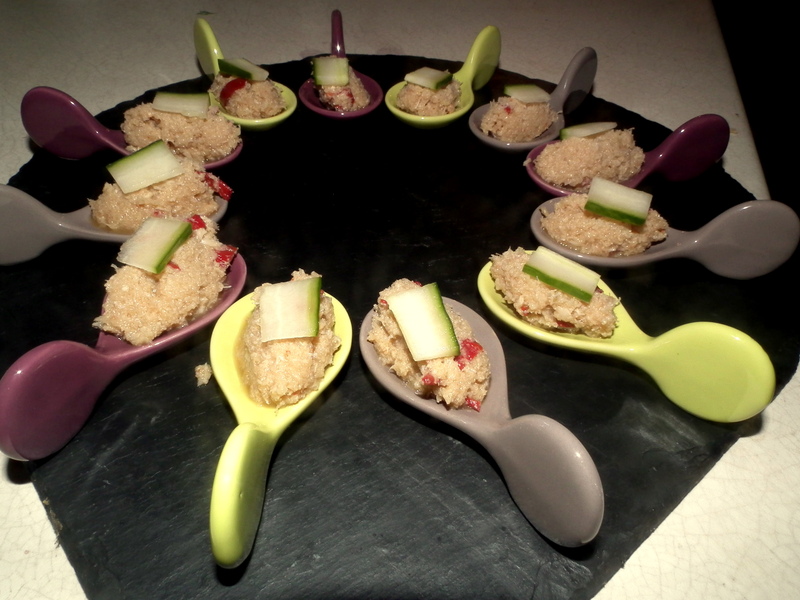 Firstly, we had Spoons of Spicy Thai Crab Salad. These individual mouthfuls are fragrant and tangy as crab meat is doused in lime juice, fish sauce, chilli and sesame oil. A touch of sugar gives it that distinctive sweet and sour zing and topped with a little cucumber for crunch, they are undeniably yummy. 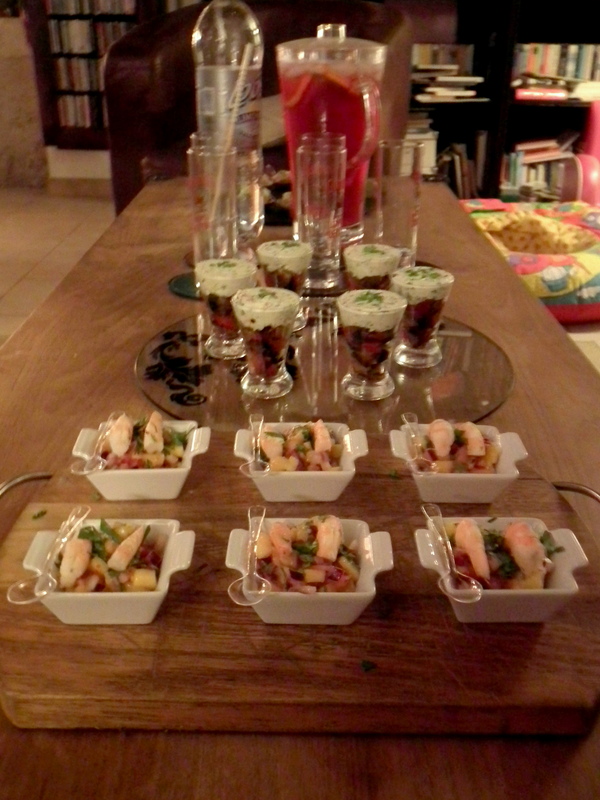 Then we had Verrines of Ratatouille & Fresh Goats Cheese. 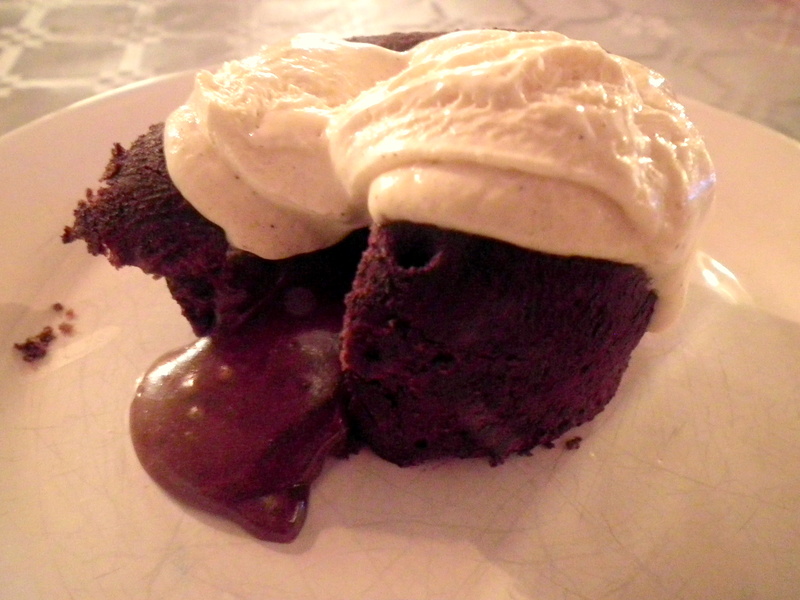 I took the recipe for this from Stéphane Reynauds new book  365 Good Reasons To Sit Down To Eat. I made the tasty ratatouille the day before my guests arrived and it kept well in the fridge until the big night. 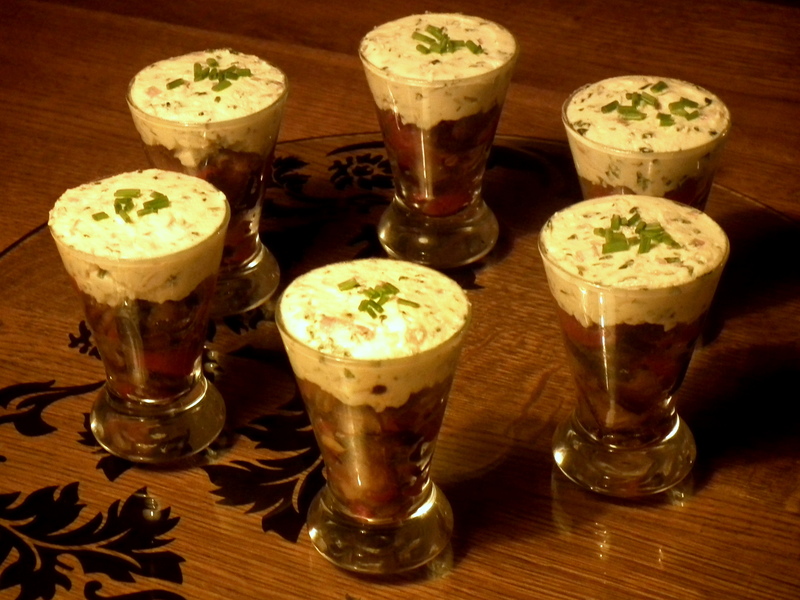 Then all that needed to be done was to mix the young soft Goats cheese with chopped shallots, mint, chives and olive oil and assemble in the elegant verrines and serve with dainty spoons. Absolutely knock out! 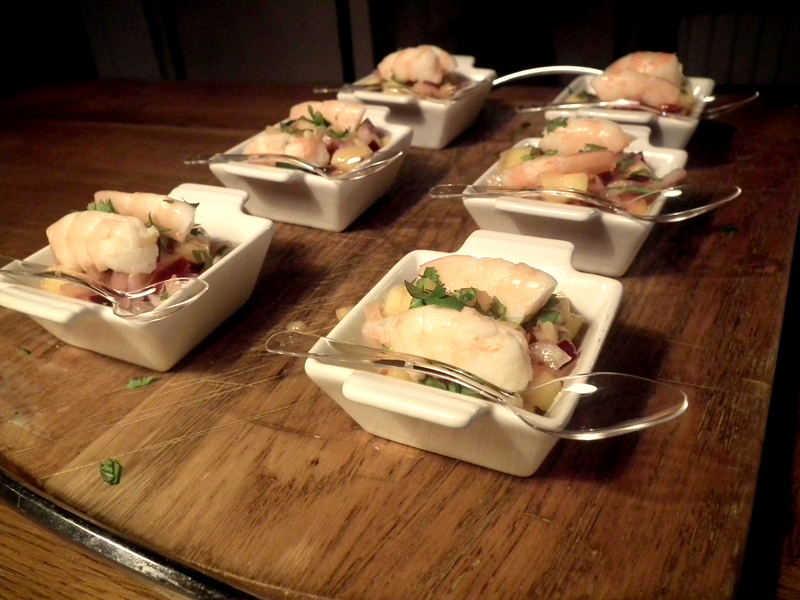 The final canapé was Prawn & Mango Salsa which we served in little square dishes. This is a delectable mix of mango, red onion, chilli, lime and coriander topped with a fresh king pawn which is both sweet and sharp and exciting in your mouth. All these three canapés certainly set the tone for the evening and were gobbled up with much enthusiasm. Moving on, for the main course, I made Spiced Salmon Fillets with Saffron Beurre Blanc (recipe by Master Chef 2010 winner Drhuv Baker). One of our friends is a vegetarian who eats fish hence the choice of this dish. Although salmon might not be the most exciting choice, I think this recipe offers a really interesting mix of flavours that elevates the dish into something really special and suited to our celebration. I spent considerable time preparing the fish, diligently pin-boning and then scraping the skin free of all scales and moisture to ensure that it would be mega crispy when cooked. An aromatic mix of fennel seeds, coriander seeds and yellow mustard seeds are toasted and crushed to coat the flesh of the salmon. Potatoes are fried with turmeric and chilli powder turning them a warm a golden colour. And a beurre blanc is made by reducing white wine vinegar and fish stock infused with saffron and then adding oodles of butter! 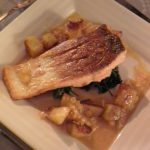 The dish is a wonderful union of all these parts; crispy skin, succulent salmon flesh, iron of spinach, gentle crunch of spiced potatoes all brought together with a rich sauce, sweet from the saffron yet with just the right acidity. It really was an unusual and delightful dish. .. I took my time making them earlier in the week, diligently following each step of the recipe to the letter in the hope that I would not fail. I spent a long time just preparing the pots, coating them in butter, chilling and then repeating and dusting with cocoa butter. 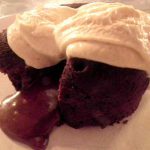 I whipped the fondant mix for an age just to be totally sure that it was OK and then popped them in the freezer and hoped for the best. 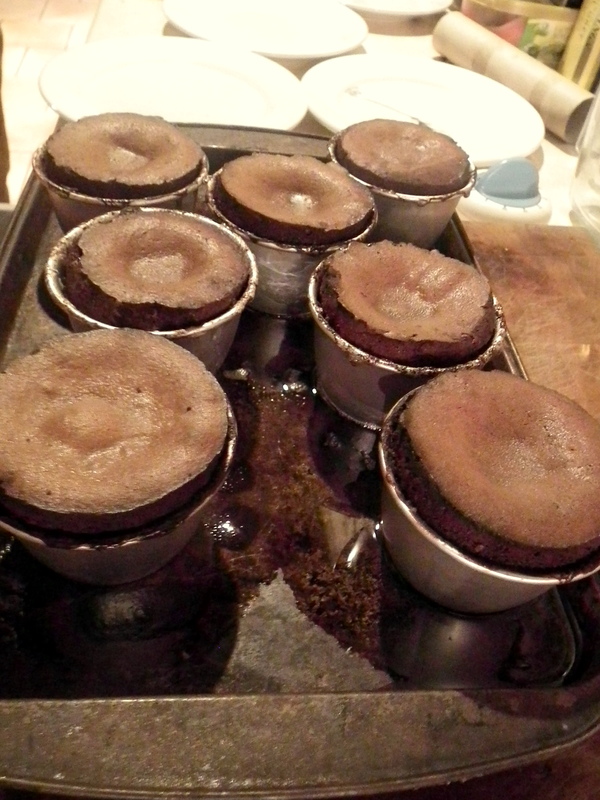 On the night I could do no more than heat them up at the correct temperature for exactly the right time. They popped out of their pots with ease and I served them, still expecting the worst, jaded by a long since previous failed attempt. But rejoice, oh ye husband of little faith, they were utterly and completely perfect! 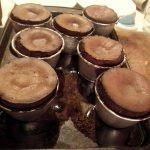 Their centres oozed out onto the plate like a flow of chocolate lava, decadent but still light in texture, they are my new favourite pudding in the whole wide world! And my stuffed guests somehow found some room to finish them off! So, thats all for now. I hope your New Years celebrations were just as much fun as ours. What was on your menus? 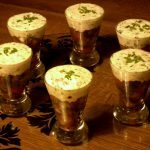 7 Comments on "Feasting with Friends & Family  Part II"
You’ve really got me going on the canapés, and the presentation! We’ve made a few the last few Christmases and they were loads of fun. Inspiring, thanks! Thanks Angela! I think canapes can be the best part of the whole meal if you make them exciting! It all looks delicious, but it’s making me hungry! Is it lunch time yet? Tell Jules to hurry up and get your lunch ready!!! Wow, wow, wow! Can I be your friend from the UK now please!!! Bravo for braving the fondants! Thanks for sharing your feast.